A correctly focused image which looks equally blurry throughout is usually the result of camera shake. It is caused by the camera moving while the photo is being taken. This occurs most often when the level of light is low. The period of time the camera's shutter is open to record the image on the camera's sensor is called the shutter speed. 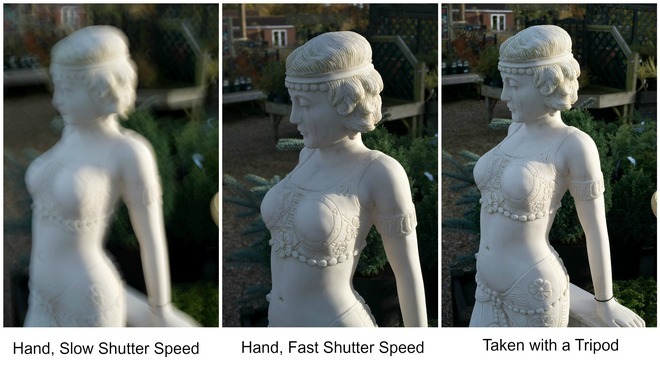 The slower the shutter speed, the more likely you will have camera shake. How can you prevent camera shake? a tripod is bulky but it will allow you to take crisp, sharp pictures. place your camera on a stable surface such as a table or a gate. brace yourself by leaning against a solid upright object such as a wall or tree. use vibration reduction (or image stabilisation), if available. increase the available light (and therefore the shutter speed) by using your flash. How can you tell if you will get camera shake? First check your camera's shutter speed. The faster the shutter speed is, the less likely you will be to have problems. This is why you don't get camera shake with your camera in auto shooting mode selected, in bright sunlight. With lots of light available, your camera will select a fast shutter speed automatically. How fast does your shutter speed need to be? This depends on the actual lens you are using. You first need to work out its the maximum focal length. It will be written on your lens; it will look like this: 18mm-55mm. So the maximum focal length for this particular lens is 55mm. Then you double the lens's maximum focal length, in this example 110. You then convert this figure to a fraction and you get 1/110 (In maths this is called the reciprocal of 110). Use this lens with a shutter speed of 1/110th of a second or faster and you will avoid camera shake. Our ability to hold a camera steady varies between people. Some people are naturally more steady, but you will have less of a problem with practice. Drinking lots of strong coffee doesn't help!